As discussed in yesterday's AMD Phenom II 955 launch article, the new 3.2GHz 955 is now the king of the midrange. Intel Core i7 still owns the very top of the performance pyramid, but the 45nm Phenom II is now our CPU of choice for buyers that can't (or won't) move to Intel's LGA-1366. The Phenom II 955 beat the more expensive Intel Q9550 in application performance and in overclocking performance. Today at least the best processor choice for an upper entry to midrange PC is the Phenom II. That could change with deep Intel price reductions on Core 2 Quad and Duo processors or possibly the coming introduction of Core i5 processors, but AMD's long catch-up strategy is finally starting to pay off in the latest 45nm Phenom II offerings. With the new 955 and 945, and with Phenom II now the CPU of choice where it competes, it is time to revisit Phenom II system components in an update to our last Phenom II System Buyers' Guide. In January AMD launched their new quad-core Phenom II processors that were compatible with existing AM2+ motherboards and DDR2 memory. The new Phenom II processors were the first truly competitive CPUs since Intel's introduction of Core 2. The Phenom II 940 and 920, then priced at $275 and $235, performed better than the equivalently priced Intel Q9400 and Q8200. However, the first Phenom II processors support only DDR2 memory and can only be mounted on an AM2+ motherboard. 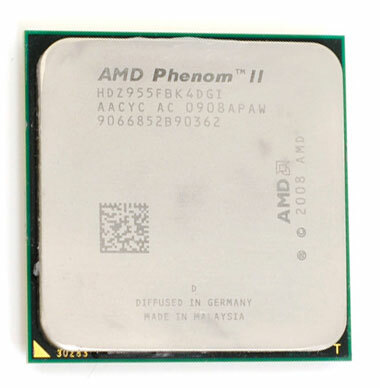 A few weeks later AMD filled out the Phenom II line downward with five new models with integrated DDR3 and DDR2 support. These new AM3 processors could mount in socket AM3 and support DDR3 memory or mount in AM2+ and support DDR2 memory. As is generally the case, Intel responded quickly with Core 2 price cuts, which we discussed in our Phenom II X4 810 and X3 720 article. AMD followed suit with price adjustments that placed the Phenom II processors at price points where they compete very well with similarly priced Intel Core 2 processors. Yesterday AMD filled in the top of the Phenom II line. In just three months, Phenom II has gone from introduction to a new socket and expanded socket compatibility. It now provides a complete processor lineup covering the price range from $125 to $245, with stock processor speeds from 2.5GHz quad to 3.2GHz quad. Here's a quick rundown on the Phenom II parts, including the original Phenom 9950. AMD Phenom II X4 805 2.5GHz 2.0GHz 2MB 4MB 95W ? With the latest additions to the Phenom II line, the processors are now achieving what AMD hoped for with their introduction. In testing the new 45nm CPUs are at the worst competitive with the latest Intel Core 2 Quad (Penryn) processors. However, in most cases the Phenom II processors are the top performer at each price point, making the Phenom II the current midrange processor of choice. They are also the first AMD processors in over two years that can also compete with Intel processors in overclocking. In our own tests we were able to overclock to the 3.8GHz range at stock voltage with some Phenom II samples, and we reached 4.2GHz with voltage increases and beefed up cooling. The new Phenom II does exactly what AMD needs it to do to compete and win through the midrange. The first Phenom II processors, the 940 and 920, feature a DDR2 only controller and an un-core bus speed of 1.8GHz. These two models will be phased out over time. The rest of the Phenom II line is designed for socket AM3 or AM2+ and feature a dual mode DDR3/DDR2 memory controller. Yesterday's 955BE and 945 include an updated core and new stepping, and the new core will eventually find its way into the entire Phenom II line. The new 955/945 are the best overclockers ever from AMD and they reflect a more mature 45nm core that will likely benefit other Phenom II models as well. Keep in mind that Intel's latest Core i7 is still as much as 30% faster in some applications than the Core2/Phenom II processors, so AMD did not reclaim the ultimate performance crown. However, Core i7 is at present a high-end CPU, with prices starting at $300 and extending to over $1000 just for the CPU. If you're not concerned with overclocking, one alternative for a complete Core i7 system is to just pick up something like the Dell studio XPS. Or if you prefer a bit more flexibility, you might want to look at our last Buyers' Guide. As you approach the upper range of Phenom II performance, we would certainly suggest looking at Core i7, but for now let's return to the midrange. With AMD now the best performer through the midrange of CPU space, it is time to take a closer look at putting together systems with the latest Phenom II processors. With a broad CPU price range of around $120 to around $245 there are quite a few choices in processors for a Phenom II system. This Phenom II Buyers' Guide looks at three different builds that you might be considering. For builders who want a Phenom II system for as little money as possible we put together a Phenom II budget system. The goal is simple: build a competent and balanced Phenom II system for as little money as possible. Another typical buyer is attracted to the Phenom II because they want the best bang-for-the-buck. For these buyers we have put together two value systems, one based on the socket AM3 DDR3 standard and another based on the AM2+ DDR2 platform. Value for some means bringing over as many of their current components as possible, and that often means reusing DDR2 memory. With two options buyers can mix and match what they have, go for a new DDR2 720BE system overclocked to the hilt, or go somewhere in between. Finally, there is the full-blown performance Phenom II system. We hesitate to call this a high-end system, since the most expensive Phenom II is just $245. This is an upper midrange CPU price. Performance, however, is the best you will find with any CPU south of the Intel Core i7. Going along with the CPU, our system components for the performance system are more upper midrange than high-end. That means we will not be pairing the Phenom II with a $1200 30" LCD monitor for 2560x1600 gaming. However, the CPU power is there if you aspire for more. You could definitely use a high-end graphics card and 30" monitor on a Phenom II 955 or 945 or 940 if you choose, and you would achieve superb performance. I am building a system using the mobo and heatsink fan. This is not a good combo for overclocking. The reason is the the Xigmatek is so big, that it blocks the use of one of the yellow RAM slots that the Asus manual states are best for over clocking. I built the system using the components I previously mentioned and you are absolutely correct: the Xigmatek is so big, it does extend over one of the yellow memory slots and this board recommends the yellow slots for overclocking. It might me possible to squeeze memory in the slot under the Xigmatek, but I would worry about it touching the Xigmatek and getting too hot. The other issue with this mobo is the location of the connections for the front of your case. The front case connectors for my Lian Li case are too short as the Asus connections are located at the furtheset possible spot from the connectors. Other than those two issues, I am happy with this build. The PC turned on and I had no problems once I realized that graphics cards now need to be directly connected to the PS. I'd love to hear any comments from more experienced systems builders on the components I plan to use. This is my second build. The first build did not go well. The PC would not turn on and I had no idea where the problem lay. Then I had the extraordinarily bad luck of getting two bad mobos and compatibiity problems between the mobo that finally worked and my PVR card. It cost me $400 to have someone troubleshoot the PC to get it working. The choice of boards is based on this guide and comments at Newegg. Seems like a board that has cause very few problems for the majority of people. Also Newegg has a bundle with the AMD chip for a $35 savings. Does anyone know if the Xigmatek heatsink on the CPU will conflict with the heatsinks on the OCZ Reaper memory? Depends on how far your slots are from your CPU but I'm almost certain that the first dimm set (row 1 & 2) of most motherboards will be blocked by the Xigmatek heatsink if you plan to use OCZ reaper memory. I have two boards (Asrock AOD790/Gigabyte MA790XT) with s-1283v heatsinks and the OCZ Reaper memory kit will not clear on the dimm set closest to the CPU on either board. However, IMO the S-1283 line is one of the best and affordable air-cooler series out there especially if your case can handle the size. I haven't had any issues with memory and the Xigmatek, as the fin assembly is raised up a bit on the heatpipes before it can potentially overhang the memory slots. However, I haven't really tried it with the Reaper memory, which was selected because of its fast timings (6-6-6) and effective heatpipe cooling. As you saw in the 955BE launch article, the Phenom II worked better with fast memory timings than it did with higher memory speeds in our OC tests. 3 - OCZ Intel Extreme Edition 4GB (2 x 2GB) 240-Pin DDR3 SDRAM DDR3 1600 (PC3 12800) Dual Channel Kit Desktop Memory Model OCZ3X16004GK at 7-7-7 timings at $53 after $30 rebate. These are all standard profile dimms and they snuggle underneath the Xigmatek cooler just fine. The important thing for the Phenom II memory controller is to shop for the tightest timings you can afford with speed of at least DDR1333. For Intel we would probably look for even faster speed, but higher speed does not help that much on Phenom II's memory controller. Great, thanks for the reply. It's great that you read the comments and respond. I was looking at OCZ Gold memory at 8-8-8-24 since the price was $44 after the rebate, but I'm reconsidering now . . . I'm using the Xigmatek Dark Knight on my FoxConn A7DA-S motherboard with 4 sticks of ram. They all fit fine, Even the Reaper memory with the overly large cooler would fit into 3 of the slots, its only the slot closest to the CPU that might have clearance issues.